Heroin addicts in Los Angeles shoot up and struggle to survive. Director Floyd Mutrux’s pseudo-documentary about heroin addicts in Los Angeles (starring real-life users) is an episodic ensemble flick which emphasizes atmosphere rather than plot. Indeed — appropriately enough — not much happens in the lives of these motley addicts: they shoot up, stare glassy-eyed at each other, talk about time spent in jail, attempt to secure more dope, and, occasionally, manage a semblance of romance. Most devastating is watching a teenage couple (listed simply as “Larry” and “Pam” in the credits) wasting their lives for the allure of smack; despite knowing that a doctor-supervised vitamin B-12 solution was used in the needles, the scene in which Larry shoots up Pam in the face remains particularly gruesome. 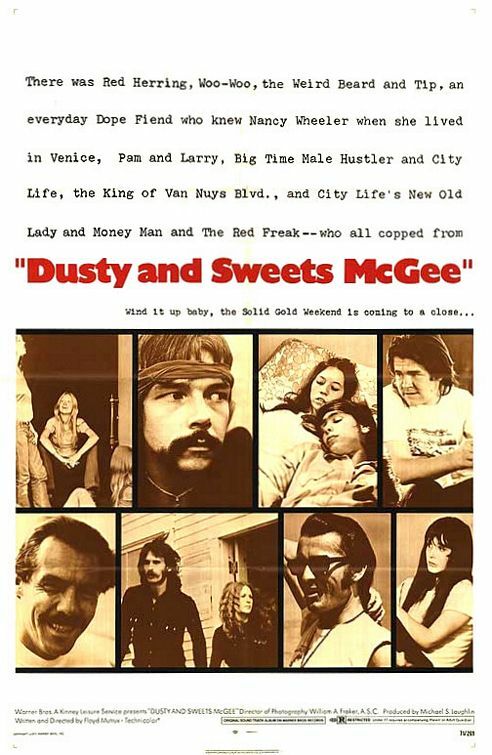 Dusty and Sweets (named after the street monikers of two of the film’s characters) was pulled from screens just one week after its release in 1971, and became somewhat of a cult hit after this. It’s hard to get ahold of these days — presumably because of copyright issues, considering the enormous number of popular songs used on the soundtrack. Ironically, it’s the uplifting soundtrack which saves this film from devolving into pure voyeuristic misery. I’d love to see a follow-up documentary about these folks, but my guess is that they weren’t long for this world. No, but it’s certainly worth a look if you can find a copy. While Peary lists this as a Cult Movie in the back of his book, I think it’s more relevant as a time-capsule glimpse into a specific subculture of the early 1970s.